Hope you had a wonderful Christmas yesterday. I had a gastronomical feast yesterday at the Pearl of Orient i.e. Penang Island. But that will be for another post. I had been wanting to share with you another serum that I like but had been procrastinating a lot. Since it is a holiday today, I have decided to do a review. I bought the Clinique Laser Focus serum after reading a review by another blogger and hearing good testimonies by Juli, a blogger friend. I have finished using the bottle and wanted to repurchase this but delayed my repurchase due to too many unopened serums that I still have in my beauty shelf. However, I will definitely repurchase some time next year. Water, Dimethicone, Butylene Glycol, Polysorbate 20, Methyl Trimethicone, Vinyl Dimethicone/Methicone Silsesquioxane Crosspolymer, Bis-PEG-18 Methyl Ether Dimethyl Silane, Glycerin, Silica,Polymethylsilsesquioxiane, Lauryl PEG-9 Polydimethylsiloxyethyl Dimethicone, Methyl Gluceth-20, Polysilicone-11, Sigesbeckia Orientalis (St. Paul’s Wort) Extract, Retinyl Palmitate, Plankton Extract, Punica Granatum (Pomegranate) Juice Extract, Arabidopsis Thaliana Extract, Sea Whip Extract, Whey Protein/Lactis Protein/Proteine Du Petit-Lait, Pinanediol, Camphanediol, Glycine Soja (Soybean) Protein, Ergothioneine, Acetyl Hexapeptide-8, Caffeine, Micrococcus Lysate, Palmitoyl Oligopeptide, Anthemis Nobilis (Chamomile), Linoleic Acid, Sodium Mannose Phosphate, Ethylhexylglycerin, Caprylyl Glycol, Carbomer,Glyceryl Polymethacrylate, Cholesterol, Aminopropyl Ascorbyl Phosphate,Hyaluronic Acid, Sodium Hyaluronate, Tocopheryl Acetate, PEG-8, Xanthan Gum, Sodium Citrate, Sodium Carbomer, Disodium EDTA, Phenoxyethanol. 1. The serum has a smooth texture and spreads easily. It absorbs easily too. The texture is quite similar to Estee Lauder Advanced Night Repair (ANR) but it does more work than ANR. 3. I like Clinique Laser Focus better than ANR because it can be applied at the eye area. Most serum cannot be used at the eye area. Although this serum has not erased all my fine lines, I believe that consistent use will reduce the appearance of new lines. 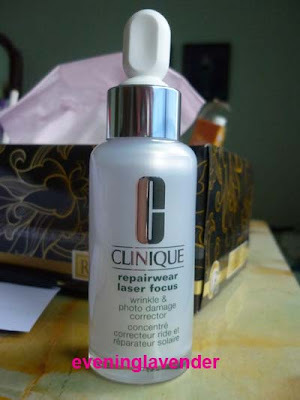 The Clinique Laser Focus retails at RM200 for 30ml. It is much cheaper in Singapore Airport. That product surely fit to you. Thanks for the review. Can I ask if the product is able to lighten up any acne scars marks? I don't think it can lighten acne marks. May be slightly.